toyslikenew doesn't have any items in their booth! THE place to go for toys!!! Always represents everything with honesty. Wonderful to work with. Just a great seller! Fast, careful shipper. One of the very best sellers! Great Products, Outstanding Customer Service and One of the Cutest Logos Around! Awesome seller. She always has such cute stuff !!! 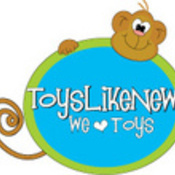 Go Green with Toyslikenew! Great products like new! And they are recycled! Great prices & A Great shopping experience!